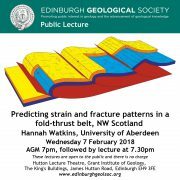 The Annual General Meeting of the Society will be held at 7pm on Wednesday 7th February, followed by a lecture by Hannah Watkins on Predicting strain and fracture patterns in a fold-thrust belt, NW Scotland. *Christian Ranken will take a reduced workload through to Sept 2018, during which Don Cameron and Andrew Rushworth will cover certain aspects of the Treasurer’s role. Planet Earth is a series of distinguished lectures, which run annually, and each year an internationally renowned natural or social scientist working within the broad remit of GeoSciences is invited to deliver a series of engaging talks aimed at different audiences. 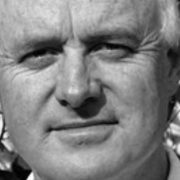 This year Professor James Jackson from the University of Cambridge will be involved in a number of activities inspiring academics, professionals within the field of geosciences, students, and the local community. Professor Jackson will be giving a lecture entitled: 50 years of Plate Tectonics: why do people still die in earthquakes? There will be a poster session 6-7pm prior to the main event, together with a post-reception from 8pm providing an excellent opportunity to meet with the speaker, key academics and researchers, industry and local government representatives all within the field of GeoSciences. We anticipate that this event will be popular, and therefore recommended early booking to ensure your place. If you are interested in attending please register here. General Admission: £5.00.